Histamine is an important inflammatory mediator that is released in airways during an asthmatic response. However, current antihistamine drugs are not effective in controlling the disease. The discovery of the histamine H4 receptor (H4R) prompted us to reinvestigate the role of histamine in pulmonary allergic responses. 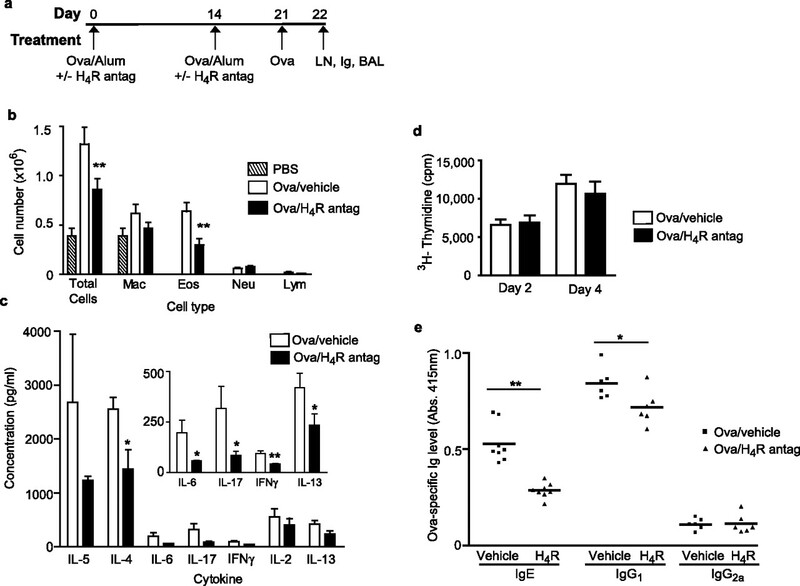 H4R-deficient mice and mice treated with H4R antagonists exhibited decreased allergic lung inflammation, with decreases in infiltrating lung eosinophils and lymphocytes and decreases in Th2 responses. Ex vivo restimulation of T cells showed decreases in IL-4, IL-5, IL-13, IL-6, and IL-17 levels, suggesting that T cell functions were disrupted. In vitro studies indicated that blockade of the H4R on dendritic cells leads to decreases in cytokine and chemokine production and limits their ability to induce Th2 responses in T cells. This work suggests that the H4R can modulate allergic responses via its influence on T cell activation. The study expands the known influences of histamine on the immune system and highlights the therapeutic potential of H4R antagonists in allergic conditions. Asthma is characterized by airway hyperresponsiveness and chronic inflammation of the airways (1). Although many cell types are involved in the pathogenesis of the disease, Th2 T cells, which produce IL-4, IL-5, and IL-13 in the airways, are thought to be most important for its perpetuation. The disease can be exacerbated and driven to chronicity by repeated acute episodes of inflammation, often in response to specific allergens. Mast cells, resident in increased numbers in the asthmatic airway, release potent inflammatory mediators upon allergen cross-ligation of Ag-specific, surface bound IgE (2, 3). Histamine is a well-described mediator of this acute inflammation and is involved in smooth muscle contraction, edema, vasodilation, mucus hypersecretion, and adhesion molecule up-regulation. Histamine is produced during acute asthmatic episodes and its role in many physiological functions associated with asthma is well characterized. However, it has not been thought to be a significant contributor to the disease because histamine H1 receptor (H1R)3 antagonists, effective in symptomatic treatment of allergic rhinitis, have little or no efficacy in asthma. Evidence is now accumulating to suggest that histamine has a role in inflammation and allergy beyond that traditionally described (4, 5). Notably, recent data support a role for histamine as a modulator of immune function (6). Histamine affects the maturation of dendritic cells and specifically regulates the development of Th1 and Th2 T cells. Histamine has been shown to inhibit IL-12 production and stimulate IL-10 production in dendritic cells, promoting a Th2 phenotype (7, 8, 9, 10). These Th2-promoting actions are logical considering the causal link between the mast cell, the major source of histamine, and Th2-mediated immune responses, notably antiparasitic activity and allergic diseases (3, 4, 11). Recently, a fourth histamine receptor (H4R) has been identified. H4R is primarily expressed on eosinophils, T cells, dendritic cells, basophils, and mast cells (12, 13), cell types intimately involved with development and perpetuation of allergic responses. This receptor has been shown to mediate mast cell, eosinophil, and dendritic cell chemotaxis and can modulate cytokine production from dendritic cells and T cells (10, 14, 15, 16, 17, 18). In this study, we use H4R-deficient (H4R−/−) mice and specific H4R antagonists to demonstrate the importance of the H4R in a mouse model of allergic airway inflammation that has some similarities to human asthma, and demonstrate a novel mechanism for the regulation of T cell activation through H4R signaling on APCs. These observations underscore the importance of histamine as a link between the innate and adaptive immune responses and provide evidence for the utility of H4R antagonists in the treatment of allergic diseases. H4R-deficient mice were generated as previously described (16) and crossed on to BALB/c background for at least five generations. Homozygous wild-type controls of the same backcross number and generation were used as controls. BALB/c mice were obtained from Charles River Breeding Laboratories for pharmacology studies. Genetically mast cell-deficient mice, WBBFF1-KitW/KitWv (W/Wv) and the congenic normal WBBFF1-+/+ were obtained from The Jackson Laboratory. BALB/c-DO11.10 TCR transgenic mice from The Jackson Laboratory were used for in vitro studies. Age-matched animals were used in all experiments. Mice were housed in community cages on a 12-h light cycle and fed mouse chow and water ad libitum. All procedures were performed according to the internationally accepted guidelines for the care and use of laboratory animals in research and were approved by the local Institutional Animal Care and Use Committee. JNJ 7777120 ((5-chloro-1H-indol-2-yl)-(4-methyl-piperazin-1-yl)-methanone) and JNJ 10191584 ((5-chloro-1H-benzoimidazol-2-yl)-(4-methyl-piperazin-1-yl)-methanone) were synthesized as described previously (19, 20, 21). OVA (grade V) was purchased from Sigma-Aldrich. Abs used were purchased from BD Pharmingen and cytokines from R&D Systems. Batches of FBS were tested for endotoxin and the lot with the lowest response was used in all cell cultures (Invitrogen Life Technologies). TLR ligands, Salmonella typhimurium LPS and Pam3Cys (N-palmitoyl-S-(2,3-bis(palmitoyloxy)-(2RS)-propyl)-(R)-cysteinyl-(S)-seryl-(S)-(lysyl)3-(S)-lysine) were purchased from Sigma-Aldrich and EMC Microcollections, respectively. TLR9 ligand (CpG, ODN 1668) was purchased from Genbase. Chemists at Johnson & Johnson Pharmaceutical Research and Development synthesized the histidine decarboxylase (HDC) inhibitor, α-fluoromethyl histidine. Female BALB/c mice (6- to 8-wk-old), H4R−/− mice or littermate H4R+/+ controls, mast cell-deficient mice, or wild-type controls were used. In all cases animals were sensitized to OVA by i.p. injection of 10 μg of OVA in 0.2 ml of 2% aluminum hydroxide (alum, Al(OH)3) on day 0 and day 14, before repeat aerosol exposure to OVA on day 21 through day 24. For OVA aerosol exposure, mice were placed in a Plexiglas box and exposed for 20 min to an aerosol of a 5% OVA solution generated by a Pari Star nebulizer (Pari-Werk). Mice were euthanized 24 h after the final challenge, except in the case of dosing around sensitization where they were euthanized 48 h after a single OVA challenge on day 21. After euthanasia (pentobarbital, 100 mg/kg, i.p. ), bronchoalveolar lavage (BAL) was performed on their lungs with PBS (PBS with 0.1% BSA, 0.5 mM EDTA) four times with 0.3 ml each. If present, RBC were lysed and the total number of leukocytes in an aliquot of the BAL fluid (BALF) was determined using a Coulter Z2 Counter (Beckman-Coulter Electronics). Differential leukocyte counts were made by counting 200 cells on stained (Diff-Quik; Dade Diagnostics) cytospin preparations by light microscopy using standard morphologic criteria. H4R antagonists JNJ 7777120 or JNJ 10191584, formulated in 20% hydroxypropyl-β-cyclodextrin or saline were used for all experiments. For dosing at challenge the H4R antagonist was administered by oral gavage (p.o.) or s.c. 15 min before each OVA challenge. This dosing regime was also followed for the experiments with the W/Wv mice. For dosing at sensitization the H4R antagonist was administered p.o. 15 min before and 2 h after each OVA sensitization, but not before challenge. In the comparison of JNJ 7777120 and loratadine, the H4R antagonist was given at 20 mg/kg and loratadine at 0.2 and 20 mg/kg. Peripheral bronchial lymph node cells were isolated from immunized mice, pooled and cultured in quadruplicate (5 × 105cells/well) as previously described (22) with medium (RPMI 1640 supplemented with 10% FBS, nonessential amino acids and 2-ME) alone or with medium plus OVA (100 μg) for 96 h. Cytokine levels in cell culture supernatants were determined using Luminex multiplex system using Bio-Rad Bioplex and Linco Research as per manufacturer’s protocol reagents (mouse eighteen or twenty-two cytokine kit, respectively). The IL-17 isoform measured was the A isoform. Proliferation was measured by [3H]thymidine incorporation for 18 h. Averages were determined from four replicates. Serum samples were obtained from animals at experiment end by cardiac puncture. Total IgE, IgG1, and IgG2a levels were measured as per manufacturer’s instructions (BD Pharmingen). OVA-specific IgG1 and IgG2a was determined using plates coated overnight with 2 μg/ml OVA in sodium carbonate buffer (pH 9.5; Sigma-Aldrich) and detection Abs from the total IgE, IgG1, and IgG2a. The Ab levels were quantitated by measurement of the absorbance at 415 nm. OVA-specific IgE was measured as described in MacLean et al. (23). To ensure linearity of response, serial dilutions of serum were assayed as described previously (23). CD4+ T cells and CD11c+ cells were purified from freshly excised mouse spleens using AutoMac in accordance with the manufacturer’s protocols (Miltenyi Biotec). Bone marrow-derived dendritic cells were prepared as described previously (24). Before use, the bone marrow-derived dendritic cells were purified by negative selection (removal of CD19+ and CD11b+ cells) by AutoMac. CD4+ T cell polarization was performed in the standard manner as described previously (25). CD11c+ dendritic cells were purified from the spleens of H4R−/− and wild-type mice, by positive selection using CD11c+ beads and AutoMac. Cells were plated at 105 per well and incubated overnight with OVA, with or without 10 μM JNJ 7777120. The next day cells were washed and 106 purified DO11.10 transgenic CD4+ cells were added along with anti-IFN-γ (10 μg/ml), anti-IL-12 (10 μg/ml), and IL-4 (10 ng/ml) (all BD Pharmingen). After 6 days, the CD4+ cells were purified and 105 cells were stimulated with plate-bound anti-CD3/anti-CD28 for 18 h. Cytokine levels in cell culture supernatants were determined using Luminex multiplex system using Bio-Rad Bioplex and Linco Research as per manufacturer’s protocol reagents (mouse eighteen or twenty-two cytokine kit, respectively). Unstimulated purified DO11.10 transgenic CD4+ T cells (105) were stimulated with titrated doses of anti-CD3/anti-CD28 Abs. A constant 2:1 ratio was maintained between anti-CD3/anti-CD28 Abs across the dilutions. Proliferation was measured by [3H]thymidine incorporation for 18 h. IL-17 A isoform (IL-17A) production was measured by ELISA (R&D Systems). Averages were determined from four replicates. CD11c+ dendritic cells were purified from the spleens of H4R−/− and wild-type mice, by positive selection using CD11c+ beads and AutoMac. Cells were plated at 105 per well and rested overnight, with or without 10 μM JNJ 7777120. Next day cells were spun and washed before the addition of fresh medium with or without 10 μM JNJ 7777120. One hour later TLR ligands were added (LPS or Pam3Cys, both 1 ng/ml, or CpG at 1 μM). After 24 h, the supernatants were analyzed for cytokine production by ELISA. In separate experiments, cells were stained with fluorescent Abs to the surface markers CD80, CD86, CD54, CD11c, and MHC class II (all BD Pharmingen) and analyzed by flow cytometry as per manufacturer’s protocols. In another set of experiments purified CD11c+ dendritic cells were treated overnight with various combinations of 10 μM JNJ 7777120 and 10 μM α-fluromethyl histamine. The cells were washed as described, before the addition of fresh JNJ 7777120, α-fluromethyl histamine and histamine (2 μM). The combinations are detailed in the figure legend. One hour post wash, the cells were stimulated for 24 h with LPS (1 ng/ml) and the IL-6 production measured by ELISA. Averages were determined from four replicates. Histamine production was measured using histamine ELISA kits from IBL-Hamburg per the manufacturer’s instruction. The Student’s t test was used to judge statistical significance where appropriate. In all cases the p values were calculated based on the difference between the different treatments in each study. The error bars shown represent the SD. For the cell counts and Ab titers, the average and SD are calculated from the different animals. For all other experiments the average and SD are from four replicates within a single experiment. In all cases the experiments were repeated two to three times with similar results and representative data are shown. To study the role of the H4R in the allergic inflammatory response, H4R−/− mice (16) backcrossed to the BALB/c background were subjected to an OVA-induced model of lung inflammation (26). BALF was collected after multiple OVA-aerosol challenges and cell numbers and types were determined (Fig. 1⇓a). Total cells in the BALF were significantly decreased (56%) in the H4R−/− mice along with significant decreases in macrophages (37%), eosinophils (67%), and lymphocytes (75%) compared with H4R+/+ mice (Fig. 1⇓b). To measure T cell responses the peribronchiolar lymph nodes (PBLN) were harvested and the T cells in the lymph node cell cultures were restimulated by the addition of OVA ex vivo. Cytokine profiling of these cultures showed a pronounced decrease in the Th2 cytokines IL-4 (86%), IL-5 (95%), and IL-13 (67%) and the inflammatory cytokines IL-6 (58%) and IL-17A (92%) in the PBLN from the H4R−/− mice (Fig. 1⇓c). 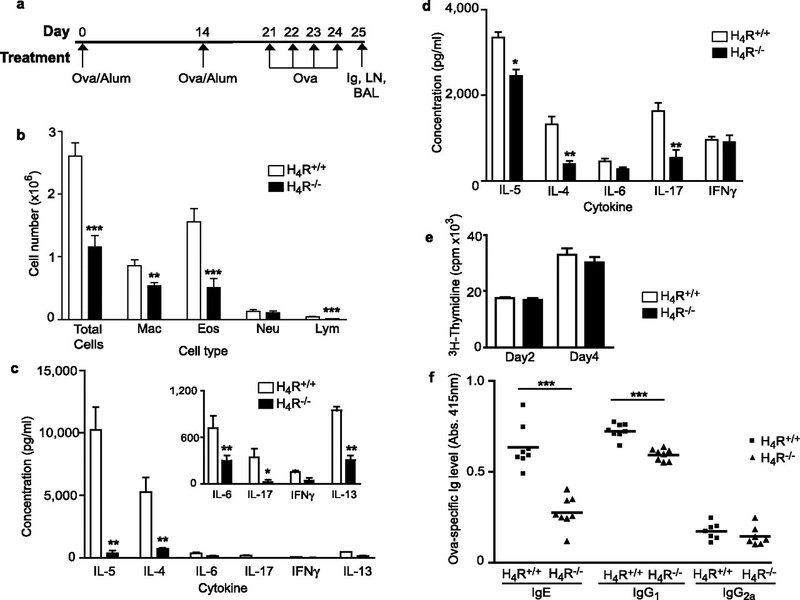 To distinguish between the role of the H4R in lung-specific and systemic immune responses, the cytokine profile of splenocytes was measured from H4R−/− and H4R+/+ mice that had been sensitized to OVA. Restimulation of H4R−/− splenocytes with OVA showed significant decreases in IL-4 (69%), IL-5 (28%), and IL-17 (67%), indicating that the effects of H4R ablation on the immune system are systemic and not limited to the lung (Fig. 1⇓d). There was no change in IFN-γ production suggesting that the immune system was not being skewed to a Th1 response. Although the lack of the H4R resulted in changes in cytokine production, it did not change the proliferative responses of T cells to OVA restimulation (Fig. 1⇓e). There was also a decrease in OVA-specific IgE (54% decrease) and IgG1 (18% decrease) in the H4R−/− mice but no change in IgG2a (Fig. 1⇓f), once again supporting the conclusion that the effects seen are due to a dampening of the Th2 response instead of a skewing toward Th1. Reduced airway inflammation in H4R−/− mice. a, H4R+/+ or H4R−/− mice (n = 9 mice per group) were sensitized to OVA i.p. on days 0 and 14 before repeat aerosol exposure to OVA on day 21 through day 24. b, The total number of cells and a differential cell count in H4R+/+ (□) or H4R−/− (▪) mice were calculated from BALF collected 24 h after the final challenge. c, PBLN were collected 24 h after the last OVA challenge and lymphocytes were isolated and cultured with 100 μg of OVA. Cytokine levels were measured at 96 h using Luminex multiplex analysis or ELISA. d, Splenocytes were isolated from OVA-sensitized H4R+/+ or H4R−/− mice, and were cultured for 96 h with added OVA. Cytokines were measured using Luminex multiplex analysis or ELISA. e, OVA-specific proliferation of PBLN was measured by [3H]thymidine incorporation on day 2 and day 4 of the in vitro culture. f, Serum samples were collected by cardiac puncture and assayed by ELISA for the presence of OVA-specific IgE, IgG1, and IgG2a Abs. Results similar to those shown were obtained from one additional experiment. ∗, p < 0.05; ∗∗, p < 0.01; ∗∗∗, p < 0.005. The H4R selective antagonist (27), JNJ 7777120, was used to dissect the role of the H4R during the sensitization or challenge phases of the model. The animals were first sensitized twice to OVA and then 7 days later the H4R antagonist was administered s.c. 15 min before each OVA challenge (Fig. 2⇓a). After 4 days of challenge the eosinophils, lymphocytes, and total cell counts in the BALF were reduced in the compound treated animals by 55, 52, and 43%, respectively (Fig. 2⇓b). PBLN cultures restimulated with OVA showed significant decreases in IL-5 (41% decrease) and IL-17 (76% decrease) production, but no changes in IFN-γ or IL-2 production (Fig. 2⇓c). IL-6 and IL-13, which were decreased in the H4R−/− animals, were unchanged. The decreases in cytokine production were not related to the proliferation of the T cells because there was no difference in proliferation on day 4 between PBLN from vehicle or H4R antagonist-treated animals (data not shown). These results are consistent with the findings in the H4R-deficient mice. In a separate experiment the efficacy of H4R and H1R antagonists was directly compared in this model. When dosed at challenge JNJ 7777120 at 20 mg/kg p.o. significantly reduced BALF eosinophils, whereas loratadine at either 0.2 or 20 mg/kg p.o. had no effect (Fig. 2⇓d). Interestingly, both loratadine and JNJ 7777120 at 20 mg/kg reduced the number of lymphocytes. ), OVA-challenged and H4R antagonist JNJ 7777120-treated (20 mg/kg p.o.) (▪) mice 24 h after the final challenge. Results similar to those shown were obtained from at least two additional experiments. ∗, p < 0.05; ∗∗, p < 0.01; ∗∗∗, p < 0.005. The results from the H4R−/− mice and those treated with the H4R antagonist during challenge suggested that the H4R may be involved in T cell activation. To address this issue the H4R antagonist JNJ 7777120 was administered before and directly after OVA-alum sensitization, but not at challenge (Fig. 3⇓a). The H4R antagonist used has a short half-life (2 h) and thus it is not expected to affect the inflammatory response at OVA aerosol challenge, which is performed 7 days after antagonist dosing (27). With this dosing regimen, eosinophils and total cells were significantly decreased in BALF after a single OVA challenge by 53 and 34%, respectively (Fig. 3⇓b). The response in PBLN to OVA restimulation was attenuated, with a decrease in the production of IL-4 (43%), IL-13 (43%), IL-6 (71%), IL-17 (73%), and IFN-γ (53%) (Fig. 3⇓c). There was no change in IL-2 or in the total proliferation measured on day 2 or day 4 (Fig. 3⇓d). Note that the cytokine levels here are lower than in Fig. 1⇑c or Fig. 2⇑c because a single challenge protocol was used. In addition, the levels of OVA-specific IgE (44%) and IgG1 (15%) were attenuated by H4R antagonist treatment, whereas IgG2a levels were unchanged (Fig. 3⇓e). The decreased Ag-specific IgE and IgG1 and the reduction in CD4+ T cell effector/memory cytokines in the PBLN from mice dosed at sensitization is suggestive of the H4R being required for efficient CD4+ T cell priming. H4R antagonists block airway inflammation when dosed at sensitization. a, Wild-type BALB/c mice (n = 8 mice per group) were sensitized to OVA i.p. on days 0 and 14 before being challenged once with OVA on day 21. JNJ 77777120 or vehicle was administered orally 15 min before and 1 h after each sensitization. b, The total number of cells and a differential cell count were calculated from BALF collected from PBS-challenged (▧), OVA-challenged and vehicle-treated (□), and OVA-challenged and H4R antagonist-treated (▪) mice 48 h after the final challenge. c, PBLNs were collected 24 h after the last OVA challenge and lymphocytes were isolated and cultured with 100 μg of OVA. Cytokine levels were measured at 96 h using Luminex multiplex analysis or ELISA. Note that these cytokine levels are lower than levels found in Fig. 1⇑c or Fig. 2⇑c because a single challenge protocol was used. d, OVA-specific proliferation of PBLN was measured by [3H]thymidine incorporation on day 2 and day 4 of the in vitro culture. e, Serum samples were collected by cardiac puncture and assayed by ELISA for the presence of OVA-specific IgE, IgG1, and IgG2a Abs. Results similar to these shown were obtained from two other experiments. ∗, p < 0.05; ∗∗, p < 0.01; ∗∗∗, p < 0.005. The in vivo results described suggest that the H4R plays a role in modulating CD4+ T cell activation during both the priming and effector phases of the model. To further analyze this idea, in vitro activation of T cells was studied. To study Ag-specific stimulation of naive T cells, OVA reactive transgenic CD4+ T cells were purified from DO11.10 TCR transgenic mice and stimulated under Th2-polarizing conditions using CD11c dendritic cells from H4R+/+ or H4R−/− mice loaded with OVA as APCs. After 6 days of polarization, the T cells were repurified and no difference in the total number of cells was observed, suggesting that the lack of the H4R on the dendritic cells did not affect T cell proliferation or viability (data not shown). The T cells were then restimulated overnight with anti-CD3 and anti-CD28 to assess their cytokine production. T cells activated with H4R+/+ dendritic cells showed a typical Th2 response with production of IL-4 and IL-5 and no detectable IFN-γ. In addition the inflammatory cytokines IL-6 and IL-17 were produced. Although the T cells stimulated with H4R−/− dendritic cells also showed a Th2 response, the production of IL-4, IL-6, and IL-17 were significantly reduced by 58, 36, and 32%, respectively (Fig. 4⇓a). To address whether this effect was due directly to lack of the H4R on dendritic cells or to possible developmental defects in the H4R−/− dendritic cells, the experiments were repeated using H4R+/+ dendritic cells incubated with a H4R antagonist. The T cells activated by dendritic cells treated with the antagonist behaved similarly to those stimulated with H4R−/− dendritic cells in that there was a reduction in the production of IL-4 (31%), IL-6 (54%), and IL-17 (63%) (Fig. 4⇓b). IL-5 was also produced, but it was not significantly changed with either H4R−/− dendritic cells or the H4R antagonist. The results suggest an important role for the H4R in dendritic cell function. To rule out a direct effect of the H4R antagonist on T cells, the administration of histamine or JNJ 7777120 had no effect on the anti-CD3/anti-CD28 induced proliferation of naive DO11.10 T cells (Fig. 4⇓c) or their IL-17 production (Fig. 4⇓d). However, this direct stimulation of T cells may not be optimal to see a H4R-mediated effect and further work is necessary. Nevertheless, these results suggest that signaling through the H4R on dendritic cells enhances the Th2-polarized T cells. H4R promotes the generation of Th2-positive CD4+ T cells in vitro. a, CD11c+ dendritic cells purified from H4R+/+ (□) or H4R−/− (▪) mice were pulsed with OVA overnight. Cells were washed and cocultured under Th2-polarizing conditions for 7 days with splenic CD4+ T cells purified from DO11.10 TCR transgenic mice. CD4+ cells were then purified and stimulated for 24 h with anti-CD3/anti-CD28 after which cytokines were measured by Luminex multiplex analysis. b, CD11c+ dendritic cells purified from H4R+/+ mice were pulsed with OVA and cultured overnight with saline (□) or 10 μM JNJ 7777120 (▪). Cells were washed and cocultured under Th2-polarizing conditions for 7 days with splenic CD4+ T cells purified from DO11.10 TCR transgenic mice. CD4+ cells were then purified and stimulated for 24 h with anti-CD3/anti-CD28. Proliferation (c) or IL-17 production (d) of DO11.10 CD4+ T cells in response to anti-CD3/anti-CD28 stimulation was measured in the presence of vehicle (▪), 2 μM histamine (blue inverted triangle), 10 μM JNJ 7777120 (red triangle) or histamine plus JNJ 7777120 (green diamond). ∗, p < 0.05; ∗∗, p < 0.01; ∗∗∗, p < 0.005. To characterize the effect of H4R blockade upon dendritic cell function, the role of the H4R on cytokine production and activation marker up-regulation was investigated. Activation of purified CD11c+ splenic dendritic cells was achieved using ligands for TLR2, TLR4, or TLR9. LPS-stimulated (TLR4 agonist) dendritic cells from H4R−/− mice and dendritic cells that were treated overnight with a H4R antagonist produced significantly less IL-6 compared with wild-type and untreated dendritic cells, respectively (Fig. 5⇓, a and b). In addition, the H4R−/− dendritic cells produced lower levels of KC (47%) and MIP1α (36%) (Fig. 5⇓a). These chemokines were also decreased upon treatment with antagonist, but the changes did not reach statistical significance. In both cases LPS also induced IP-10 and TNF-α production and this was unchanged in the H4R−/− cells or with antagonist treatment. Treatment of the dendritic cells with a TLR2 agonist, Pam3Cys, yielded similar results: IL-6, KC, and MIP1α were significantly reduced (Fig. 5⇓, c and d) both in H4R−/− and antagonist treated cells. IP-10 and TNF-α were also produced, but were not consistently decreased. A TLR9 agonist, CpG, also showed decreases in IL-6, KC, MIP1α, and IP-10 in H4R−/− and H4R antagonist treated cells, although the decrease in KC production did not reach statistical significance with antagonist treatment (Fig. 5⇓, e and f). For all TLR stimulation IL-10, IL-12p70, and MCP1 were produced, but were unaffected by H4R ablation or H4R antagonist ad-ministration (data not shown). The up-regulation of cell surface activation markers for dendritic cells by the TLR ligands was also studied. CD80, CD86, CD54, CD11c, and MHC class II were all up-regulated by TLR2 or TLR4 ligands, but were unaffected by the H4R antagonist (data not shown). 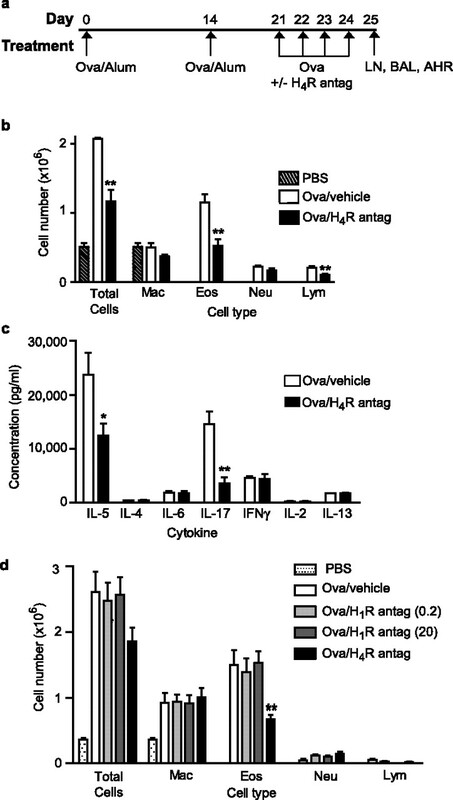 The H4R modulates TLR ligand-induced cytokine production in dendritic cells. CD11c+ dendritic cells purified from H4R+/+ (□) or H4R−/− (▪) mice (a, c, and e) or cultured overnight without (□) or with 10 μM JNJ 7777120 (▪) (b, d, and f) were stimulated with 1 ng/ml LPS (TLR4) (a and b), Pam3Cys (TLR2) (c and d), or CpG (TLR9) (e and f). Cytokine levels were analyzed 24 h later by Luminex multiplex analysis. Samples were run in triplicate. ∗, p < 0.05; ∗∗, p < 0.01; ∗∗∗, p < 0.005. The fact that isolated H4R−/− dendritic cells and those treated with a H4R antagonist were unable to induce a strong Th2 polarization of T cells in this coculture system implies that histamine was present in the cultures. The inclusion of anti-CD117 beads to remove mast cells during the purification procedure and the use of dialyzed (histamine-free) medium ensured that it is unlikely that mast cells or exogenous histamine was signaling “constitutively” through the H4R in this system, although the presence of basophils cannot be ruled out. Thus, the production of endogenous histamine by stimulated and unstimulated dendritic cells was investigated. When bone marrow-derived dendritic cells were cocultured with DO11.10 CD4+ T cells, there was a measurable production of histamine that was further increased with addition of Ag (Fig. 6⇓a). Histamine production was also observed from dendritic cells activated by LPS (Fig. 6⇓b) or alum (Fig. 6⇓c), which was the adjuvant used in the mouse model. These results are consistent with previous studies suggesting that dendritic cells express HDC (28). To test the role of endogenous histamine production in this in vitro system, purified CD11c+ dendritic cells were cultured overnight with α-fluoromethyl histidine, a well-characterized HDC inhibitor. This treatment resulted in a decreased IL-6 production in response to LPS that could be reversed by histamine administration (Fig. 6⇓d). Furthermore, JNJ 7777120 could block the histamine augmentation of IL-6 production in HDC-inhibited cells. These results suggest that histamine can be produced by dendritic cells in vitro and that it can act in an autocrine fashion to help drive cytokine and chemokine production. Histamine production by dendritic cells. a, Histamine production by bone marrow-derived dendritic cells cultured with DO11.10 CD4+ T cells in the presence (▴) or absence of OVA (▪). b, Histamine production by bone marrow-derived dendritic cells cultured in the presence (▪) of absence (□) of LPS. c, Histamine production by bone marrow-derived dendritic cells cultured in the presence (▪) of absence (□) of alum. Supernatants were collected (b and c) at the designated times and histamine measured by ELISA. d, Effects of α-fluoromethyl histidine on IL-6 production. Samples were run in triplicate and ∗, p < 0.05; ∗∗, p < 0.01; ∗∗∗, p < 0.005. The in vitro results show that histamine can be produced by dendritic cells and help drive activation of Th2 CD4+ T cells. To evaluate the source of histamine in vivo, the airway inflammation model was performed in mast cell-deficient (W/Wv) mice. In this case a second H4R antagonist, JNJ 10191584, was used (Fig. 7⇓a). Consistent with the results in Fig. 2⇑, in wild-type mast cell-sufficient mice, the antagonist dosed during challenge showed decreases in total BAL cells (54%) and eosinophils (75%) (Fig. 7⇓b), as well as decreases in IL-4 (51%), IL-5 (35%), IL-6 (39%), IL-17 (39%), and IFN-γ (66%) production from PBLN cultures (Fig. 7⇓c). Although there were some differences in the inflammatory responses in the wild-type and mast cell-deficient animals, the effects of the H4R antagonist were similar (Fig. 7⇓, b and c). These results suggest that mast cells are not the source of histamine that activates the H4R in the model. H4R antagonists are still effective in mast cell-deficient mice. a, Mast cell-deficient mice (W/Wv) or the wild-type strain (n = 8 mice per group) were sensitized to OVA i.p. on days 0 and 14 before repeat aerosol exposure to OVA on day 21 through day 24. JNJ 10191584 was administered p.o. 15 min before each challenge (similar to that in Fig. 2⇑). b, The total number of cells and a differential cell count was calculated from BALF collected from wild-type vehicle-treated mice (▧), wild-type H4R antagonist-treated mice (light gray bar), W/Wv vehicle treatment mice (□) and W/Wv H4R antagonist-treated mice (▪) 24 h after the final challenge. c, PBLNs were collected 24 h after the last OVA challenge and lymphocytes were isolated and cultured with 100 μg of OVA. Cytokine levels were measured at 96 h using Luminex multiplex analysis or ELISA. d, OVA-specific proliferation of PBLN was measured by [3H]thymidine incorporation on day 2 and day 4 of the in vitro culture. ∗, p < 0.05; ∗∗, p < 0.01; ∗∗∗, p < 0.005. Histamine is likely to be an important mediator of allergic responses in the airway, considering the positive correlation between its abundance and asthma severity (29). Despite this and other cumulative clinical and laboratory evidence linking histamine and allergic asthma, the benefit of treatment of asthma with H1R antagonists has been disputed and their use for asthma is not widely advocated. Although H1R antagonists offer symptomatic relief of several physiological events in allergic rhinitis, such as edema and vasodilatation, they do not substantially ameliorate early or late phase bronchoconstrictive events in the asthmatic airway in response to allergen challenge. Additionally, only minimal effects on inflammation and bronchial hyperreactivity have been noted. This disconnect has several possible explanations, but is ultimately suggestive that histamine receptors other than the H1R may be more important in the pathology of asthma. The discovery of a fourth histamine receptor, and the fact that it is expressed on many cell types involved in allergic responses, suggested that the H4R may play a role in mediating the histamine effects in asthma and other allergic diseases. In this study we demonstrate a novel role for H4R signaling in the dendritic cell-mediated activation of CD4+ T cells. We also demonstrate that modulation of these H4R effects translates into efficacy in a mouse model of allergic airway inflammation with similarities to human asthma. H4R-deficient mice had diminished allergic responses vs those of wild-type controls in a well-defined model of OVA-induced allergic airway inflammation. 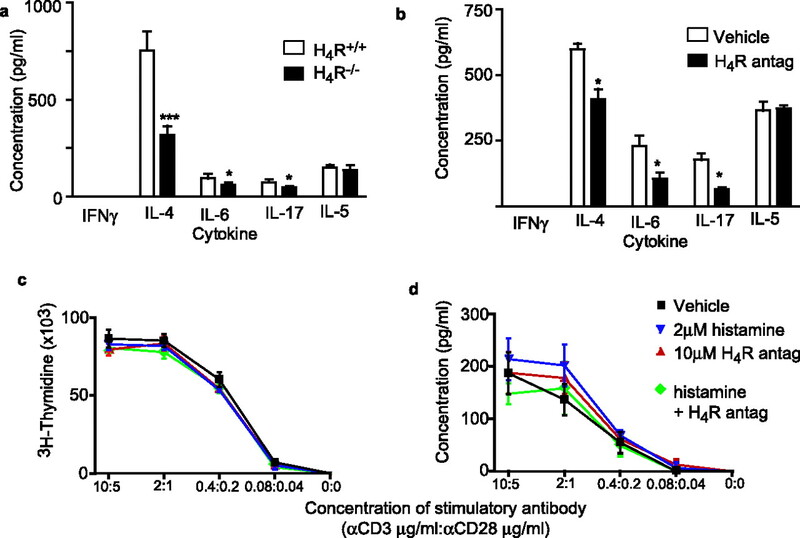 H4R+/+ mice exhibited a robust eosinophilic and lymphocytic inflammation in the lung, associated with increases in Th2-type cytokines and systemic IgE, similar to that observed in human asthmatics. All of these parameters were markedly and significantly decreased in mice lacking the H4R. These results are consistent with recent reports showing similar results in this model with HDC-deficient animals, where histamine is completely absent, and in mice treated with a histamine binding protein (30, 31). Interestingly, when the H4R is blocked only during the effector phase of the model by dosing selective antagonists before each challenge, there is a similar reduction in inflammatory cell and mediator parameters as in the H4R-deficient mice. This finding is very important from a therapeutic standpoint because intervention mainly occurs after the establishment of the disease and suggests that a H4R antagonist may be useful for the treatment of asthma in humans. In addition, these results imply that the reduction in airway inflammation seen in the H4R-deficient mice was not merely due to the systemic lack of the H4R during ontogeny and development. The combination of genetic and pharmacological ablation of H4R function clearly shows a role for the receptor in mediating allergic responses in vivo. These results suggest that H4R antagonists may have potential benefits for the treatment of asthma in humans, especially considering the correlation between histamine abundance and asthma severity. In addition, the apparent lack of efficacy of H1R antagonists in the disease raises the possibility of the involvement of other histamine receptors. The lack of efficacy of H1R antagonists in human asthma is consistent with our data showing that a H1R antagonist dosed over a broad therapeutic range around challenge in this model was not effective, whereas H4R ligands were (Fig. 2⇑d) However, there are conflicting results in the literature as to the efficacy of H1R antagonists in animal airway inflammation models and more work will be needed to separate out the relative contributions of the different histamine receptors. Previous work has suggested that CD4+ T cells are significant contributors to airway inflammation seen in this model (32). This result is supported by the critical role of the Th2 cytokines IL-4 and IL-13 (33). The effect of the H4R on T cell responses is clearly illustrated by the defects in the development of effector T cell functions such as the reduced production of Th2 cytokines IL-4, IL-5, and IL-13 after ex vivo Ag stimulation of lymphocytes. It is noteworthy from the in vivo data that lack of the H4R appears to lead to a dampening of the Th2 response without a skewing toward a Th1 response, because the levels of IFN-γ produced by Ag restimulation are unchanged, and there is no increase in the production of Ag-specific IgG2a. 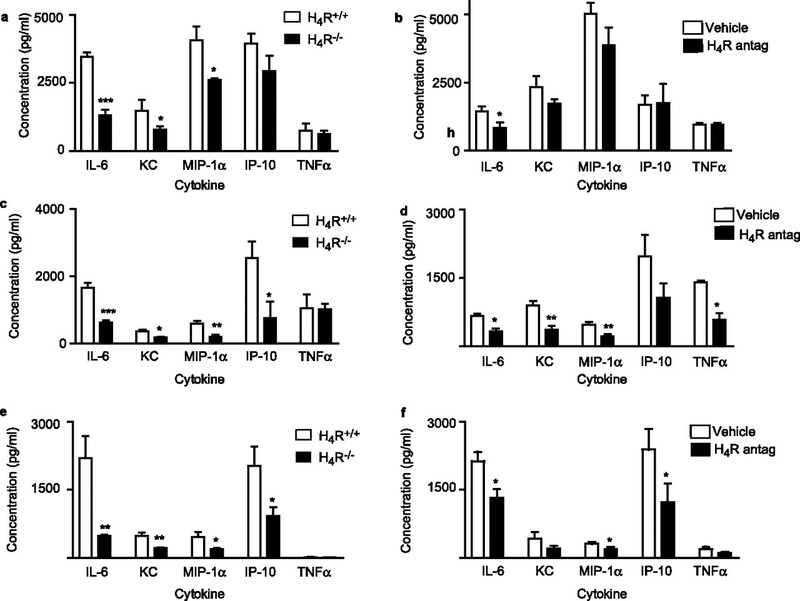 In addition to Th2 cytokines, the production of the inflammatory cytokines IL-6 and IL-17A by T cells were suppressed in the absence of H4R signaling. Both of these cytokines have been shown to play important roles in mouse models of airway inflammation and have been implicated in disease progression in humans (34, 35, 36, 37, 38, 39). Recently, it was suggested that IL-17 production defines a unique subset of T cells that may exacerbate inflammatory responses (40, 41, 42). The H4R is expressed on dendritic cells and T cells and therefore, it is possible that the H4R directly mediates dendritic cell activation of T cells in vivo. 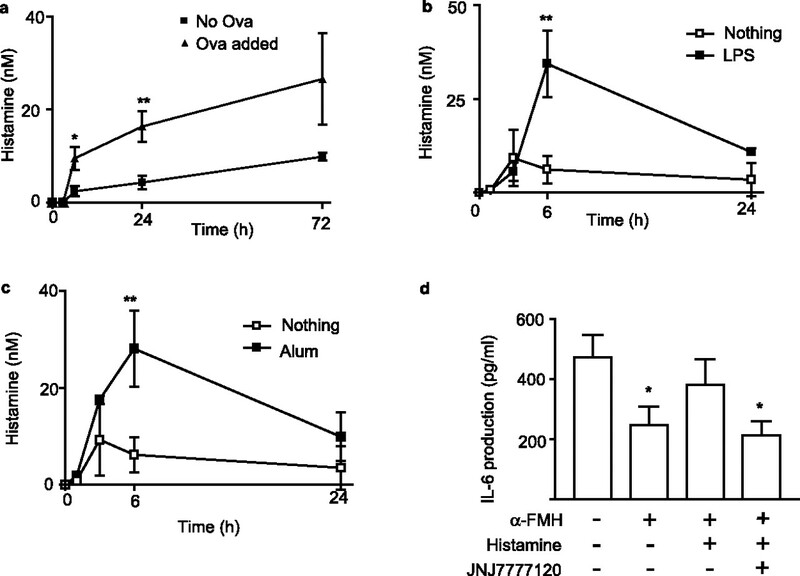 In support of this possibility, administration of the H4R antagonist at either sensitization or challenge leads to similar anti-inflammatory activity in vivo. The effects of the antagonist when dosed at sensitization are clearly indicative for the role of the H4R in the activation of T cells. During this phase of the model the priming of OVA-specific T cells by dendritic cells is crucial for the development of allergic symptoms upon allergen challenge. The fact that the H4R antagonist, when administered at sensitization, blocks the inflammation and T cell responses induced upon challenge clearly indicates that the H4R plays a role in the initial priming of T cells. This action, along with the effects on cytokine production by T cells when the antagonist is administered at challenge, suggests a role for the H4R in mediating the T cell responses underlying the inflammation induced upon exposure to OVA during both the sensitization and effector phases of the model. The role of the H4R on T cell activation was also defined in vitro where both H4R antagonist-treated dendritic cells and those derived from H4R−/− mice were unable to properly stimulate CD4+ T cells under Th2 polarization conditions. The proliferation of these T cells was normal, but there was a reduction in IL-4, IL-6, and IL-17. These same cytokines were also reduced by blockade of the H4R upon restimulation of PBLN after in vivo allergen challenge. This suggests that histamine signaling through the H4R is necessary for the proper Ag-specific activation of CD4+ T cells by dendritic cells, although direct effects on T cells cannot be completely ruled out. The in vitro data point to H4R signaling in dendritic cells having a role in the proper activation of T cells. In this study we have shown that both H4R−/− dendritic cells and those treated with an H4R antagonist have significant changes in the production of certain cytokines and chemokines upon stimulation with TLR ligands. TLR ligands were used as a generic stimulator of dendritic cells. A number of cytokines and chemokines were reduced in H4R−/− cells or those treated with a H4R antagonist including IL-6, KC, MIP-1α, and IP-10. Although it is not possible at this time to assign a mechanism for the effect of the H4R on T cell activation several of the factors that do change have been implicated in Th2 responses in vitro and in vivo (43, 44, 45, 46, 47). Activation of H4R obviously requires the presence of histamine. The in vivo studies in mast cell-deficient mice indicate that histamine does not come from mast cells. Basophils, which also store histamine like mast cells, are another possibility especially because they appear to be important for allergic responses in vivo (48). However, because the data in this study suggest that the H4R is involved in the activation of T cells by dendritic cells, it is interesting to speculate that one of these cell types may produce histamine locally. The in vitro work in this study indicates that the dendritic cells are a possible source of the histamine. Dendritic cells stimulated under varied conditions produce detectable levels of histamine. It is noteworthy that even TLR ligands that are mainly considered Th1-driving stimuli can induce dendritic cells to produce histamine, suggesting that histamine may have effects on Th1 T cells in addition to the Th2 effects that we have outlined. By using a combined genetic and pharmacologic approach we have been able to elucidate a new role for histamine signaling via the H4R in the immune system. Histamine, produced by either professional histamine producing cells, e.g., mast cells or basophils, or by dendritic cells in close contact with the CD4+ T cell at the immunological synapse, is necessary to generate the signals required to adequately educate the CD4+ T cell. Memory and effector CD4+ T cells, activated in a paucity of H4R signaling, are characterized by decreased cytokine production upon antigenic restimulation. These effector and memory CD4+ T cells generated in the absence of the H4R appear unable to mount a robust inflammatory immune response in vivo. Therefore, histamine acting through the H4R provides an important link between the innate and adaptive immune systems. The combined immunosuppressive and anti-inflammatory effects of H4R antagonists make the H4R an extremely attractive target for the treatment of a variety of diseases. We thank W.-P. Fung-Leung, Z. Cai, N. Rao, S. Sun, and I. Dodge for stimulating discussions. ↵1 P.J.D. and N.O.D. contributed equally to this work. ↵3 Abbreviations used in this paper: H1R, histamine H1 receptor; HDC, histidine decarboxylase; BALF, bronchoalveolar lavage fluid; PBLN, peribronchiolar lymph node; p.o., orally (per os). Brightling, C. E., P. Bradding. 2005. The re-emergence of the mast cell as a pivotal cell in asthma pathogenesis. Curr. Allergy Asthma Rep. 5: 130-135. Dy, M., E. Schneider. 2004. Histamine-cytokine connection in immunity and hematopoiesis. Cytokine Growth Factor Rev. 15: 393-410. Jutel, M., K. Blaser, C. A. Akdis. 2005. Histamine in chronic allergic responses. J. Investig. Allergol. Clin. Immunol. 15: 1-8. Jutel, M., T. Watanabe, S. Klunker, M. Akdis, O. A. R. Thomet, J. Malolepszy, T. Zak-Nejmark, R. Koga, T. Kobayashi, K. Blaser, C. A. Akdis. 2001. Histamine regulates T-cell and antibody responses by differential expression of H1 and H2 receptors. Nature 413: 420-425. Caron, G., Y. Delneste, E. Roelandts, C. Duez, J.-Y. Bonnefoy, J. Pestel, P. Jeannin. 2001. Histamine polarizes human dendritic cells into Th2 cell-promoting effector dendritic cells. J. Immunol. 167: 3682-3686. Caron, G., Y. Delneste, E. Roelandts, C. Duez, N. Herbault, G. Magistrelli, J.-Y. Bonnefoy, J. Pestel, P. Jeannin. 2001. Histamine induces CD86 expression and chemokine production by human immature dendritic cells. J. Immunol. 166: 6000-6006. Idzko, M., A. La Sala, D. Ferrari, E. Panther, Y. Herouy, S. Dichmann, M. Mockenhaupt, F. Di Virgilio, G. Girolomoni, J. Norgauer. 2002. Expression and function of histamine receptors in human monocyte-derived dendritic cells. J. Allergy Clin. Immunol. 109: 839-846. Gutzmer, R., C. Diestel, S. Mommert, B. Koether, H. Stark, M. Wittmann, T. Werfel. 2005. Histamine H4 receptor stimulation suppresses IL-12p70 production and mediates chemotaxis in human monocyte-derived dendritic cells. J. Immunol. 174: 5224-5232. Jutel, M., T. Watanabe, M. Akdis, K. Blaser, C. A. Akdis. 2002. Immune regulation by histamine. Curr. Opin. Immunol. 14: 735-740.
de Esch, I. J. P., R. L. Thurmond, A. Jongejan, R. Leurs. 2005. The histamine H4 receptor as a new therapeutic target for inflammation. Trends Pharmacol. Sci. 26: 462-469. Fung-Leung, W.-P., R. L. Thurmond, P. Ling, L. Karlsson. 2004. Histamine H4 receptor antagonists: the new antihistamines?. Curr. Opin. Investig. Drugs 5: 1174-1183. O’Reilly, M., R. Alpert, S. Jenkinson, R. P. Gladue, S. Foo, S. Trim, B. Peter, M. Trevethick, M. Fidock. 2002. Identification of a histamine H4 receptor on human eosinophils: role in eosinophil chemotaxis. J. Recept. Signal Transduct. Res. 22: 431-448. Ling, P., K. Ngo, S. Nguyen, R. L. Thurmond, J. P. Edwards, L. Karlsson, W.-P. Fung-Leung. 2004. Histamine H4 receptor mediates eosinophil chemotaxis with cell shape change and adhesion molecule upregulation. Br. J. Pharmacol. 142: 161-171. Hofstra, C. L., P. J. Desai, R. L. Thurmond, W.-P. Fung-Leung. 2003. Histamine H4 receptor mediates chemotaxis and calcium mobilization of mast cells. J. Pharmacol. Exp. Ther. 305: 1212-1221. Buckland, K. F., T. J. Williams, D. M. Conroy. 2003. Histamine induces cytoskeletal changes in human eosinophils via the H4 receptor. Br. J. Pharmacol. 140: 1117-1127. Gantner, F., K. Sakai, M. W. Tusche, W. W. Cruikshank, D. M. Center, K. B. Bacon. 2002. Histamine H4 and H2 receptors control histamine-induced interleukin-16 release from human CD8+ T cells. J. Pharmacol. Exp. Ther. 303: 300-307. Jablonowski, J. A., C. A. Grice, W. Chai, C. A. Dvorak, J. D. Venable, A. K. Kwok, K. S. Ly, J. Wei, S. M. Baker, P. J. Desai, et al 2003. The first potent and selective non-imidazole human histamine H4 receptor antagonists. J. Med. Chem. 46: 3957-3960. Terzioglu, N., R. M. van Rijn, R. A. Bakker, I. J. P. De Esch, R. Leurs. 2004. Synthesis and structure-activity relationships of indole and benzimidazole piperazines as histamine H4 receptor antagonists. Bioorg. Med. Chem. Lett. 14: 5251-5256. Venable, J. D., H. Cai, W. Chai, C. A. Dvorak, C. A. Grice, J. A. Jablonowski, A. K. Kwok, K. S. Ly, B. Pio, J. Wei, et al 2005. Preparation and biological evaluation of indole, benzimidazole, and theinopyrrole piperazine carboxamides: potent human histamine H4 antagonists. J. Med. Chem. 48: 8289-8298. Tsitoura, D. C., R. H. DeKruyff, J. R. Lamb, D. T. Umetsu. 1999. Intranasal exposure to protein antigen induces immunological tolerance mediated by functionally disabled CD4+ T cells. J. Immunol. 163: 2592-2600. Lohoff, M., H.-W. Mittrücker, S. Prechtl, S. Bischof, F. Sommer, S. Kock, D. A. Ferrick, G. S. Duncan, A. Gessner, T. W. Mak. 2002. Dysregulated T helper cell differentiation in the absence of interferon regulatory factor 4. Proc. Natl. Acad. Sci. USA 99: 11808-11812. Thurmond, R. L., P. J. Desai, P. J. Dunford, W.-P. Fung-Leung, C. L. Hofstra, W. Jiang, S. Nguyen, J. P. Riley, S. Sun, K. N. Williams, et al 2004. A potent and selective histamine H4 receptor antagonist with anti-inflammatory properties. J. Pharmacol. Exp. Ther. 309: 404-413. Szeberényi, J. B., E. Pállinger, M. Zsinkó, Z. Pós, G. Rothe, E. Orsó, S. Szeberényi, G. Schmitz, A. Falus, V. László. 2001. Inhibition of effects of endogenously synthesized histamine disturbs in vitro human dendritic cell differentiation. Immunol. Lett. 76: 175-182. Jarjour, N., W. Calhoun, L. Schwartz, W. Busse. 1991. Elevated bronchoalveolar lavage fluid histamine levels in allergic asthmatics are associated with increased airway obstruction. Am. Rev. Respir. Dis. 144: 83-87. Kozma, G. T., G. Losonczy, M. Keszei, Z. Komlósi, É. Buzás, E. Pállinger, J. Appel, T. Szabó, P. Magyar, A. Falus, C. Szalai. 2003. Histamine deficiency in gene-targeted mice strongly reduces antigen-induced airway hyper-responsiveness, eosinophilia and allergen-specific IgE. Int. Immunol. 15: 963-973. Couillin, I., I. Maillet, B. B. Vargaftig, M. Jacobs, G. C. Paesen, P. A. Nuttall, J. Lefort, R. Moser, W. Weston-Davies, B. Ryffel. 2004. Arthropod-derived histamine-binding protein prevents murine allergic asthma. J. Immunol. 173: 3281-3286. Komai, M., H. Tanaka, T. Masuda, K. Nagao, M. Ishizaki, M. Sawada, H. Nagai. 2003. Role of Th2 responses in the development of allergen-induced airway remodelling in a murine model of allergic asthma. Br. J. Pharmacol. 138: 912-920. Kelly-Welch, A. E., M. E. F. Melo, E. Smith, A. Q. Ford, C. Haudenschild, N. Noben-Trauth, A. D. Keegan. 2004. Complex role of the IL-4 receptor α in a murine model of airway inflammation: expression of the IL-4 receptor α on nonlymphoid cells of bone marrow origin contributes to severity of inflammation. J. Immunol. 172: 4545-4555. Doganci, A., T. Eigenbrod, N. Krug, G. T. De Sanctis, M. Hausding, V. J. Erpenbeck, E.-B. Haddad, H. A. Lehr, E. Schmitt, T. Bopp, et al 2005. The IL-6Rα chain controls lung CD4+CD25+ Treg development and function during allergic airway inflammation in vivo. J. Clin. Invest. 115: 313-325. Kurashima, K., J. Tamura, M. Fujimura, Z. Qiu, S. Nakao, N. Mukaida. 2005. Reduced serum antibody production and acute airway inflammation in interleukin 6-deficient mice challenged with ovalbumin. Allergol. Int. 54: 331-338. Konno, S., Y. Gonokami, M. Kurokawa, K. Kawazu, K. Asano, K. Okamoto, M. Adachi. 1996. Cytokine concentrations in sputum of asthmatic patients. Int. Arch. Allergy Immunol. 109: 73-78. Yokoyama, A., N. Kohno, S. Fujino, H. Hamada, Y. Inoue, S. Fujioka, S. Ishida, K. Hiwada. 1995. Circulating interleukin-6 levels in patients with bronchial asthma. Am. J. Respir. Crit. Care Med. 151: 1354-1358. Park, H., Z. Li, X. O. Yang, S. H. Chang, R. Nurieva, Y.-H. Wang, Y. Wang, L. Hood, Z. Zhu, Q. Tian, C. Dong. 2005. A distinct lineage of CD4 T cells regulates tissue inflammation by producing interleukin 17. Nat. Immunol. 6: 1133-1141. Diehl, S., C. W. Chow, L. Weiss, A. Palmetshofer, T. Twardzik, L. Rounds, E. Serfling, R. J. Davis, J. Anguita, M. Rincon. 2002. Induction of NFATc2 expression by interleukin 6 promotes T helper type 2 differentiation. J. Exp. Med. 196: 39-49. Rincón, M., J. Anguita, T. Nakamura, E. Fikrig, R. A. Flavell. 1997. Interleukin (IL)-6 directs the differentiation of IL-4-producing CD4+ T cells. J. Exp. Med. 185: 461-469. Dodge, I. L., M. W. Carr, M. Cernadas, M. B. Brenner. 2003. 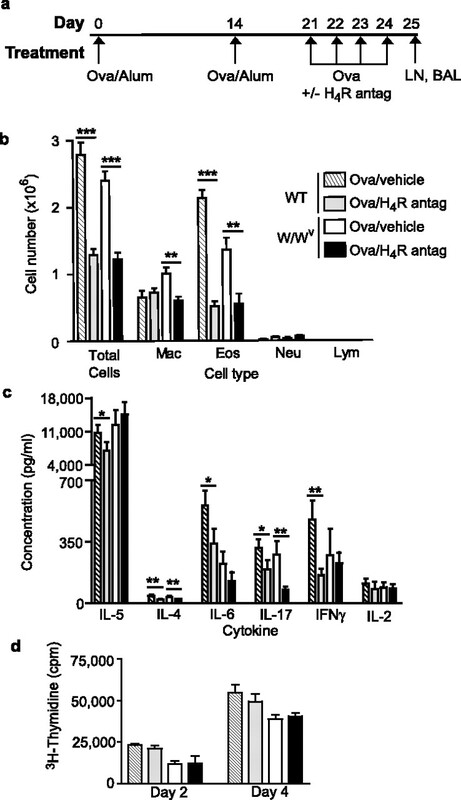 IL-6 production by pulmonary dendritic cells impedes Th1 immune responses. J. Immunol. 170: 4457-4464. Knott, P. G., P. R. Gater, P. J. Dunford, M. E. Fuentes, C. P. Bertrand. 2001. Rapid up-regulation of CXC chemokines in the airways after Ag-specific CD4+ T cell activation. J. Immunol. 166: 1233-1240. Mukai, K., K. Matsuoka, C. Taya, H. Suzuki, H. Yokozeki, K. Nishioka, K. Hirokawa, M. Etori, M. Yamashita, T. Kubota, et al 2005. Basophils play a critical role in the development of IgE-mediated chronic allergic inflammation independently of T cells and mast cells. Immunity 23: 191-202.